Didn’t do much for St. Patrick’s Day this year (last year I held a dinner party) but I did make an Irish Stew in the slow cooker…here’s the recipe! I made this in the slow cooker, but you could just as easily make it in a regular casserole dish in the oven. Ideally I would have cooked this overnight on low, but instead, I cooked it on high for 6 hours. Cooked in a slow cooker for 6 hours (high) and 12 hours (low). Set your slow cooker to high to warm up. Add the potatoes, leeks, onions and carrots. Sprinkle with black pepper and thyme. Heat a frying pan and spray with oil. Brown the meat on all sides and add to the slow cooker. Pour over the beef stock and cook on high for 6 hours, or on low overnight. About an hour from the end of cooking, add the cabbage chunks to the top of the stew. If the gravy needs thickening, add some gravy granules to reach the desired consistency. This looks so scrummy ~ I can almost smell it! This looks amazing. I love a good stew. This is such a great dish – no leftovers here! 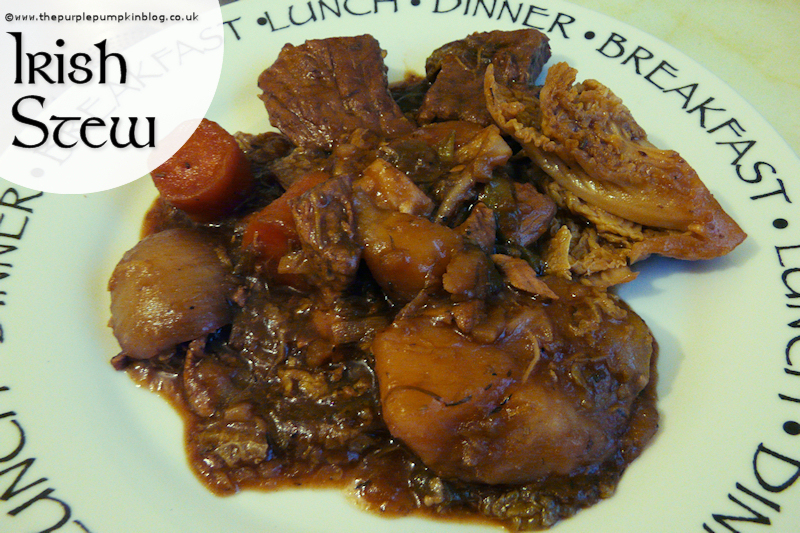 I have had stew many times but not Irish Stew so will have a go at trying out this recipe. This looks amazingly delicious, and far darker and thicker than the usual Irish stew recipes I have seen. I might even try this version myself, it looks so appealing! Looks lovely and I bet it tasted even better!!! I might make this for my Irish husband – it looks great! I absolutely love Stew. When my mother makes it, she always adds a whole peeled potato into the pot, before the chopped potatoes, and then mashes it in when its soft enough. That way you can the get liquid nice and thick, without having to add more gravy. Just thought I would offer an alternative method. That looks so rich and comforting – must make some this week. It is definitely a great comfort food – especially huddled up on cold winter nights!! Enjoy this one when you make it!! Gotta love a stew on these cold winter nights – looks like the cold is here to stay for a bit yet though :( However, excuse to eat comfort foods! This sounds delicious…. I bought some diced lamb today and intend giving this a go for dinner tomorrow.